The National Association of City Transportation Officials (NACTO) unveiled a new design manual for city streets in September, 2013. A blueprint for the 21st century streetscape, the Urban Street Design Guide demonstrates how streets of every size can be reimagined and reoriented as safe, sustainable public spaces for people walking, driving, biking, and taking transit. In cities, streets must serve multiple purposes, from storefront or doorstep to throughway. The Guide emphasizes the core principles for making urban streets great public places with an instrumental role in building communities. NACTO invites cities, states and counties to endorse this new vision for world-class street design. This unified voice endorsing safe, active, and livable streets will push federal and state governments to support the implementation these state-of-the-practice strategies. The National Association of City Transportation Officials’ Urban Street Design Guide represents a vision for world-class city street design that meets the goals of our city leaders and the desires of our communities. As transportation leaders, we find ourselves today in the midst of unprecedented change, as the demands placed upon our streets and the desires of our citizens have set in motion a new paradigm for and perception of the street itself. Pressures from public health to climate change to mobile technology are together reshaping and redefining our profession, while at the same time opening opportunities for innovation that were inconceivable only a decade ago. At a time when we are striving to react to these trends, the Urban Street Design Guide offers a concrete vision for improving the safety and livability of our streets for pedestrians, bicyclists, drivers, and transit users. City streets demand a unique approach unmet by conventional design guidelines. The guidance, vision, and flexibility articulated in the Urban Street Design Guide instigate a new and important direction for cities. We see the Guide as an indispensable tool in planning modern city streets, especially as we work toward a common vision with our partners at all levels of government. 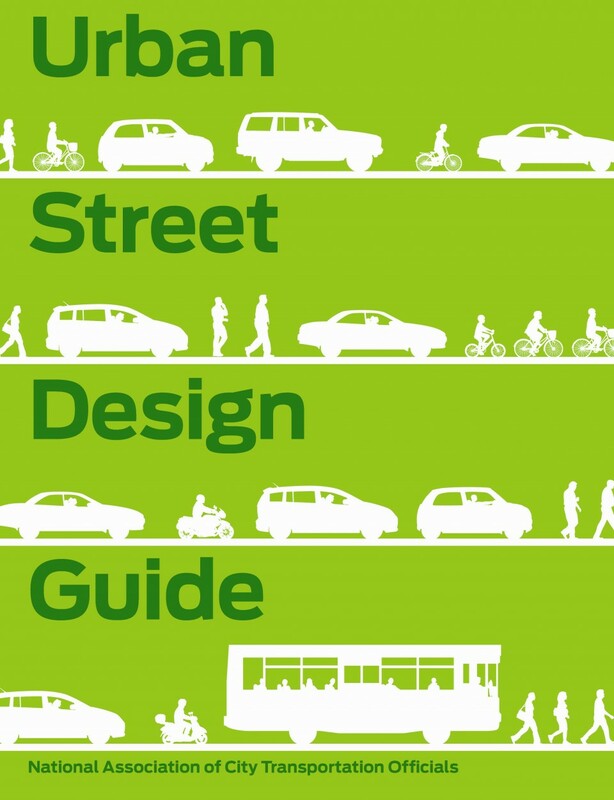 The NACTO Urban Street Design Guide is an integral and effective tool for designing streets and public spaces.